The sprawling Topkapi Palace in Istanbul (formerly Constantinople) is today a world-class museum displaying accumulated treasures of the sultans. In the 15th to 19th Centuries, the Sultans lived in and ruled the vast Ottoman Empire from the Topkapi Palace. Thousands of bureaucrats teemed within its walls. The Topkapi Palace site was militarily strategic – it stands on a formidable bluff overlooking the vital shipping lanes on the Bosphorus, Golden Horn and Sea of Marmara. You can see the continents of both Asia and Europe. The treasures of the Sultan are still mostly intact because Topkapi Palace was never plundered by enemy armies. It displays up-close one of the world's largest diamonds, the 86-carat Spoon Maker. 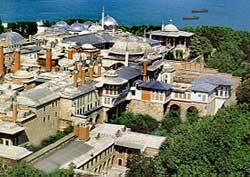 Its rooms are among the most interesting tourist attractions in Topkapi Palace. The Sultan's wives and eunuchs hatched intriguing plots to boost or destroy a son's chances of succeeding the Sultan.